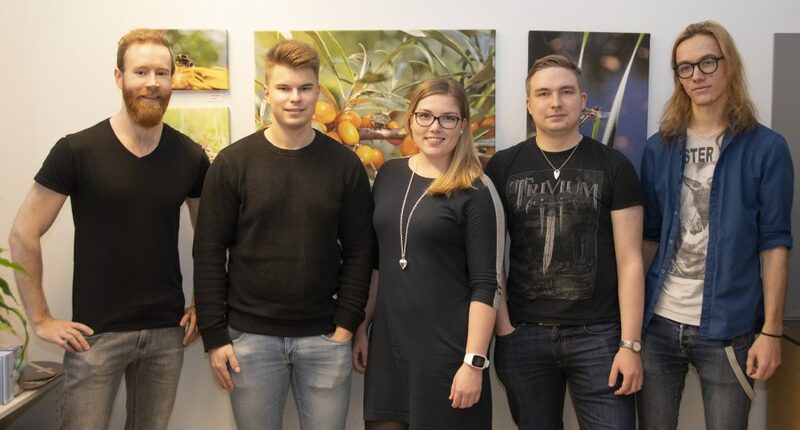 University of Turku was well represented in the Chembio 2019 event in Helsinki 27.-28.3.2019. Isabella Norrbo from our group and Maarit Karonen from NCRG presented their research in Materials in Nature seminar by FinTAC ry. In addition, Marica Engström from NCRG presented her research in the session by the chromatography society of Finland. Great job from all of you! 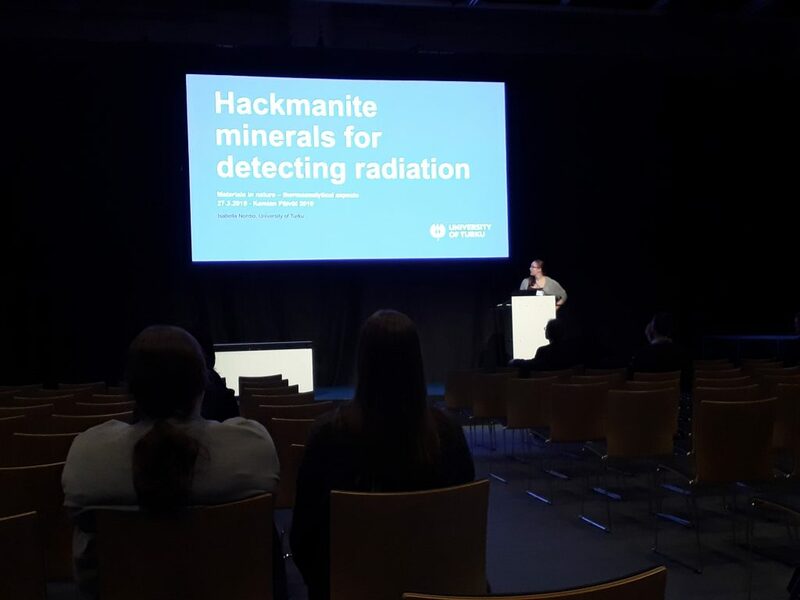 Isabella is presenting our research on hackmanites with the topic of “Hackmanite minerals for detecting radiation” at 12:10 in hall 3d. The talk is part of the FinTAC ry session “Materials in nature – thermoanalytical aspects”. Check out these two new collaboration publicatoins about persistent luminescence in glass materials. Ojha, N., Trautvetter, T., Norrbo, I., Kallide, A., Lastusaari, M., Mueller, R., and Petit, L. “Sintered silica bodies with persistent luminescence” Scripta Mater. 166 (2019) 15-18. Szczodra, A., Kuusela, L., Norrbo, I., Mardoukhi, A., Hokka, M., Lastusaari, M., Petit, L., “Successful preparation of fluorine containing glasses with persistent luminescence using the direct doping method” J. Alloy Compd. 787 (2019) 1260-1264. Opettaja -lehti kävi jututtamassa Mika Lastusaarta hänen kasvatustieteen väitöskirjansa tiimoilta. Jutun voit lukea allaolevasta linkistä. Some new publications added into the year 2019! You can choose to read about oxovanadium complexes or if you’re more interested in luminescent materals you can choose between clays and glass materials. Ojha, N., Tuomisto, M., Lastusaari, M., and Petit, L. “Phosphate glasses with blue persistent luminescence prepared using the direct doping methods” Opt. Mater. 87 (2019) 151-156. Santos, H.S., Laihinen, T., Rodrigues, L.C.V., Sinkkonen, J., Mäkilä, E., Damlin, P., Nakamura, L.K.O., Brito, H.F., Hölsä, J., and Lastusaari, M., “Red- and green-emitting nano-clay materials doped with Eu3+ and/or Tb3+” Luminescence 1 (2019) 23-38. Sobhanadhas, L.S., Kesavan, L., Lastusaari, M., and Fardim, P., “Layered Double Hydroxide-Cellulose Hybrid Beads: A Novel Catalyst for Topochemical Grafting of Pulp Fibers” ACS Omega 4 (2019) 320-330. Hossain, M.K., Haukka, M., Lisensky, G.C., Lehtonen, A., and Nordlander, E. “Oxovanadium(V) complexes with tripodal bisphenolate and monophenolate ligands: Syntheses, structures and catalytic activities” Inorg. Chim. Acta 487 (2019) 112-119. During the months of November and December we have had the privilege to host students for their Bachelor of Science laboratory work. We hope you have enjoyed the laboratory work and its ups and downs and continue with us further in your studies. There is lots of interesting research ahead! From left to right: Matti, Teppo, Roosa, Otto and Herkko. Veera is unfortunately missing from the picture. Check out the latest publication about the surface modifications of upconversion nanoparticles using polyelectrolyte multilayers and how we aim to prevent the nanoparticle disintegration in aqueous environments. Palo, E., Salomäki, M., and Lastusaari, M., “Restraining fluoride loss from NaYF4:Yb3+,Er3+ upconverting nanoparticles in aqueous environments using crosslinked poly(acrylic acid)/poly(allylamine hydrochloride) multilayers” J Colloid Interface Sci. 538 (2019) 320-326. We have the pleasure of hosting two laboratory interns, Sharifah and Aleksi, from Turku Vocational Institute. You can see them around in our laboratory for the next six weeks. Hopefully they find the stay and research with us interesting and useful!